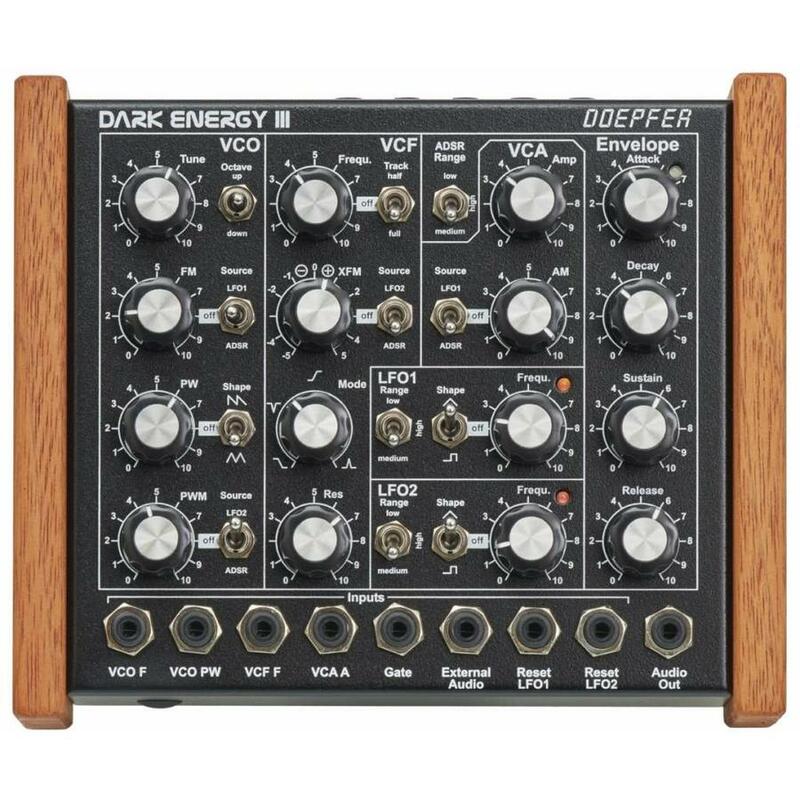 Dark Energy III is a monophonic stand-alone synthesizer with USB and Midi interface. The sound generation and all modulation sources are 100% analog, only the USB/Midi interface contains digital components. 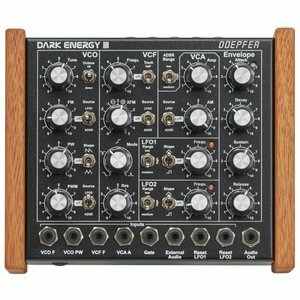 Dark Energy III is a monophonic stand-alone synthesizer with USB and Midi interface. The sound generation and all modulation sources are 100% analog, only the USB/Midi interface contains digital components. 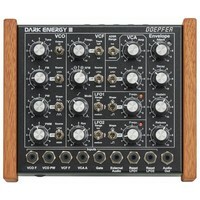 Dark Energy is built into a rugged black metal case with wooden side plates. High quality potentiometers with metal shafts are used and each potentiometer - except the filter mode control - is fixed to the case (no wobbly shafts and knobs). 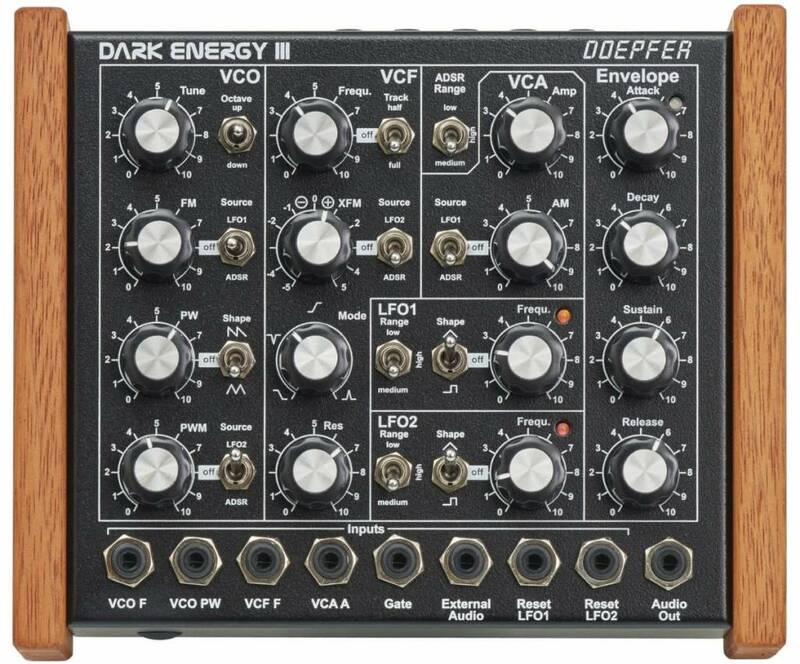 The distance between the controls is a bit wider compared to A-100 modules and knobs with vintage look are used. The interface generates the gate signal that controls the envelope generator and three analog control voltages: CV1 is used to control the pitch of the VCO, CV2 the VCF frequency (free assignable Midi controller) and CV3 is available as an additional socket at the rear panel (controlled by volume/velocity). It can be patched e.g. to the VCF control input to control the filter via velocity.